Just before they hit the stage, we managed to catch up with Underoath's keyboardist Chris Dudley. We touched on their current UK tour, 'Lost In The Sound Of Separation', what the future holds and more. Alter The Press: Thank you for joining me Chris, you play keyboards for Underoath, and how long have you been in the band, since 2000? Chris Dudley: Uh, pretty much, yeah. Late '99, 2000, I think? ATP: So, you've just come back from the UK, how was that for you? CD: It was amazing, it was our fourth/fifth time, but it was by far the best time we had been there. We played four shows, Birmingham, Manchester, London, one or two more but they were all just amazing. CD: London by far, at the Astoria was insane. ATP: You know its shutting down next year. CD: Really? I'm so glad we got to play there then. ATP: Just touching on the new record, 'Lost In The Sound Of Seperation', it follows on from 'Define The Great Line', its definitely a heavier record, was there a decision to change the style? CD: I don't think there was a decision per-say, you know, to make it heavier, it wasn't like we sat down before and said we want to make this one heavier and go. It was just like the songs were written over a wide period of time, songs we'd been working on for a year and a half, two years, some came together in one practise. It was pretty natural. We'd all get together and if we felt to write something heavy, something chill, experimental, we'd go from that. ATP: The first single 'Desperate Times', was there a reason why you chose that for the first single, did you or the label? CD: That's definitely not any of our favorite songs on the record but if that was a song what the record sounded like, it would be the 'single'. Singles are weird, you know, like MTV stuff, if its too weird they're not gonna play it, they wont play it for us anyway as were a heavy band, we don't get a lot of choice. It was our choice, at the end of the day the label are going to do whatever we want, for the sake of a single, its to get people to go 'oh well I'll listen to this' and this was the first song we thought of so. ATP: You shot a video for it as well, who came up the concept? CD: The directors, with us and videos, we usually don't have anything to do with concept or shooting as we are not very talented in that area. We go on tour, play music and when it comes to video stuff we wait for someone to present us with a cool idea and these dudes from California said we have this idea, what do you think of it and we were like oh sweet. So, we went and shot it. ATP: What is your favourite song to play live? CD: I would have think right now, its a weird thing because we use our working titles for our songs, cuz usually Spencer usually names the songs right at the end of recording and we've been writing them for a long time and I have trouble remembering the actual name. Track four off the new record (Emergency Broadcast: The End Is Near). I call it 'Elephant Stampede' because we've been playing it for nearly a year and 'Breathing In A New Mentality', I really like that song. ATP: On your setlist, when they go down on stage, does it say 'Elephant Stampede' on there? CD: Yes, it's when we first wrote it, the beginning of the track is just heavy drums, bass and vocals and distorted. Someone made a joke that it sounds like a bunch of elephants stampeding through a valley. So on our setlist it says 'Elephant'. Its funny because kids ask for a setlist when done playing and nobody knows what it means. Its just random words. ATP: Regards to writing process, we can tell 'Desolate Earth: The End Is Here' is all you. Do you get free reign to write what you want or do you all come up with ideas and put them together at the end? CD: It changes song by song, that song in particular, I wrote half that song on a plane, from London to New York one time, and the rest came out when in the studio but usually what happens is there will be an idea for a song and i'll usually put my headphones on and start messin' with different sounds or get together with Tim but usually for every part that I have, there are usually ten different parts I had an idea for but didn't end up working out. Sometimes I call Spencer, Tim and be like, 'I have this idea, what do you think?' and they go 'Oh, thats cool, thats cooler', but I will not really have a whole lot till we get in the studio then I bring the whole lot, like the protools session on the computer in and take out drums, guitars here and add stuff, so its completely different for each song. ATP: Your back on the road, are you happy to be back on the road? CD: Very much so. We had time off before we recorded, to write but we were on the road for a long time so we had a few months to relax, and recorded the record. We just did a world tour, now doing this US tour and its awesome. All the shows have been, for the most part, have been sold out, so far which is great. I can't complain. ATP: Regards, being signed to Tooth and Nail. You've been with them for a while. You guys are such an established band, you must of had major labels throwing contracts at you left, right and centre? Was there a particular reason you chose to stay with them? CD: Yeah. A few reasons. The main thing is that the business end of the music industry works if your on a major label, your whole business is up in the air. You hear about everyday about this label fired this many people and moving everything around, its such a unstable environment and for the most part those types of labels, if you sell a certain amount of records for the most part, have a hand in the creative control of what you doing, not just, 'We're going to put your record out, we're going to give the money to record', there going to be like 'Send us songs and we'll tell you if their okay to put out' and thats one thing Tooth and Nail has never done. They are like, 'Where do you want to record? ', 'How much money do you need to record? ', 'Give us the record when its done'. It's never been a question of them telling us what to do. There place of what they do, is what every labels place should be. Leave the music to the bands, and the label takes care of the label stuff. So many people at the label believe in what we do, its not a suit sitting in an office somewhere looking for someone to sell a million records, they just want us to do what we're gonna do and at the end of the day, we're not gonna turn in something thats garbage. That's a really comfortable spot to be in and even though we could go to a major label and get a big check, at the end of the day, we're not going to be as comfortable doing that as we are being on a label such as Tooth and Nail and doing what we've always done. 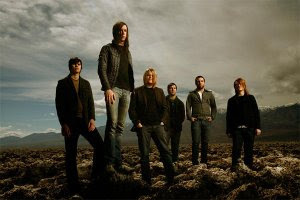 ATP: What does the future hold for Underoath? CD: Touring. Lots of it. We're doing this tour, a couple weeks off, South America, couple weeks off then we go to Australia for a week and a half, back in the UK sometime. We're doing a b-market US tour and then taking a couple months off, as me and my wife are having a baby then i'm pretty sure we're doing Warped Tour in the US then a support tour in the fall in 2009 then that takes us up to Christmas, so we're pretty booked already. ATP: I hear in the grapevine, you are playing Give It A Name 2009, any truth in that? CD: I've heard different things. I'm fairly sure we are but I haven't heard 100% if we are. ATP: Any rumours or any ideas who's playing? CD: I haven't heard a thing. I haven't spoken to any of my friends who have said they are playing. Someone said there was some weird band who was headlining, someone huge. Something bigger than they have ever done. ATP: You mean Fall Out Boy big? CD: No, bigger. I can't remember it being a scene band, but someone off the wall, like 'Wow, how did they get them there?' I can't remember who it was. It will be cool, I hope we're playing because last time we played, it was amazing. Great hang time, a lot of our friends were playing we hadn't seen in a long time. ATP: Finally, what are you listening to at the moment. Recommendations? CD: New Coldplay, its great. I just bought the new Emily Haines EP which is amazing. Nothing else new, just same stuff. Tom Petty, Pantera. Same old.